OK, I didn't. 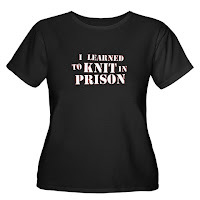 I learned to knit in college. Which isn't at all the same. I knew this day would come. I've always heard how very important it is to check your gauge, but I've never really bothered. Now that I have cast-on my husband-Christmas-gift 800 bazillion times, I know that I must always check the gauge. I accept it. I can move on -- and hopefully quickly, because I am nowhere near finished and have a few precious days to complete the thing. I finished the gifts I knitted for my little brother and his wife but I'm still working on the Guck scarf. Then for our car ride to Chicago and back, I'll finish sock #2, make that butterscotch-colored hat for me and get to work on some socks for my older brother. And how are you all coming along? This killa shirt can be purchased at The Panopticon Shop. We need our own Cafe Press store, no? I think years of making nothing but scarves spoiled me. Scarf= No Need for Gauge.